Temple St. Clair has designed and produced timeless, Florentine-crafted jewellery for the past 30 years. But it’s her passion for storytelling, love of travel and desire to incorporate it all into her craft that has propelled the longevity of her brand. The world through the eyes of an artisan is one of wonder and whimsy, filled with cultures both new and old from lands far and well-travelled. “Sometimes when they ask me for my occupation on the customs form I say, ‘well, designer,’ but ‘designer’ doesn’t encapsulate the whole story,” says Temple St. Clair, jewellery designer, artist, storyteller and explorer. Meshing old-world Florentine techniques with new-world treasures from her voyages, St. Clair has cornered the market on handcrafted golden and precious gemstone pieces. Her ability to uncover a narrative in everything from creatures to the cosmos is the driving force behind her unique collections that have been a mainstay in the world of luxury jewellery for decades. St. Clair describes the theme of her new collection, The Secret Garden, as an almost childlike appreciation for the “little crazy treasures of nature,” the microcosms that one might stumble upon whilst strolling through a forest or even their own garden — with a twist, of course. She shares more about her favourite piece (of many): the Flower Serpent Ring. At first glance, the piece is a beautiful Bombay-style ring with vibrantly coloured flowers set in 18-karat gold. But when you take a closer look, you can see the serpent slithering across the bed of breathtaking gems, and suddenly the piece develops a narrative. Her process is completely organic, a “meandering path” as she explains it, and the key to what sets her artistry apart from others in the industry. “Something will strike me, whether I see something in a tapestry or how something is depicted in another culture,” says St. Clair. Raised in the southern state of Virginia, St. Clair was born to a family that lived and breathed a love of different cultures and travel. She completed her high school education in Switzerland, developing an insatiable passion for travel in the process. “[Studying abroad] was a catalyst for what’s been a lifelong pursuit of exploration,” says St. Clair. It wasn’t long before St. Clair took flight once again, continuing on her European exploration in Florence, Italy for various abroad programs that she pursued throughout her college career. She was instantly enamoured by the language, rich Renaissance literature and art history. You see, Florence was the birthplace of the Temple St. Clair brand, the catalyst to her creative soul — all by fluke. St. Clair’s mother, who was visiting Florence at the time, sent her daughter on an errand to have an ancient coin set in a necklace. St. Clair’s encounter with that goldsmith sparked her desire to start reading into the history of gold and jewellery. Now it’s been nearly 30 years since St. Clair began working with the world’s finest goldsmiths and producing her breathtaking collections, which are available across North America, Europe and Japan. 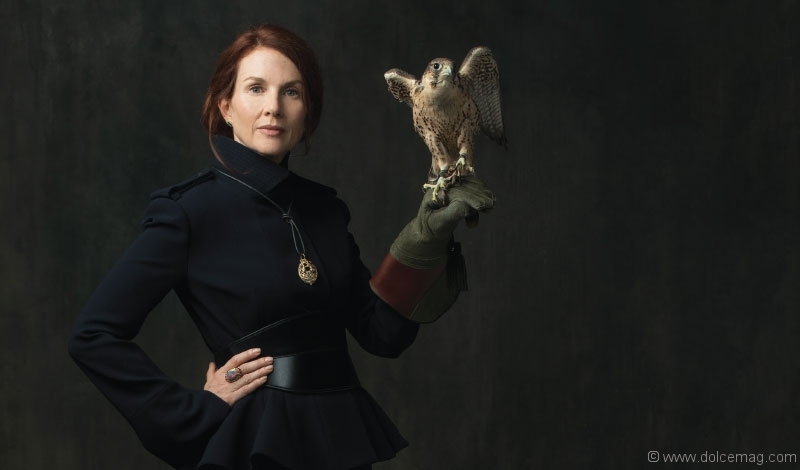 When St. Clair isn’t hard at work up in her Tuscan hillside retreat or a quiet corner of her New York abode, she is travelling the globe while keeping an eye out for worthy causes to support — especially wildlife missions. She is currently working on big feline pieces with Lion Guardians, an organization aimed at stopping the senseless sacrifice of lions in Africa. “There’s a part [of the proceeds] that flows back out to preserve these creatures that have inspired me, and are too beautiful and too precious to not be respected and taken care of,” says St. Clair. Besides her beloved Secret Garden collection, St. Clair recently completed her biggest collection yet — The Golden Menagerie. This trilogy of haute couture jewellery was a seven-year labour of love, each instalment inspired by the mythology of the animals and elements of nature she loves most. The designer has also published a book to accompany the collection. The Golden Menagerie shows St. Clair’s three haute couture collections in three different chapters — “Mythical Creatures,” “Wings of Desire” and “The Big Game” — complete with her writings on the subjects, vivid photography and watercolour works. Right now, the artist is in the most important phase of her process: researching, travelling and dreaming. photo courtesy of Atelier creative services, inc.